Human rights activist, journalist, and award-winning author Sally Armstrong has covered stories about women and girls in zones of conflict all over the world. From Bosnia and Somalia to the Middle East, Rwanda, Congo and Afghanistan, her eyewitness reports have earned her awards including the Gold Award from the National Magazine Awards Foundation and the Author’s Award from the Foundation for the Advancement of Canadian Letters. She received the Amnesty International Media Award in 2000, 2002, and again in 2011. In 1996, Sally Armstrong was honored by the YWCA of Toronto with the prestigious Women of Distinction Award in Communications. In 1997 she received the Achievement Award for Human Rights for Women from Jewish Women International; in 1998 Media Watch’s Dodi Robb Award and in 2003, the Foundation Award for Outstanding Achievement from the National Magazine Awards Foundation. In 2005, she received the Athena International Award (Chicago), the World of Difference Award from the International Alliance for Women (Florida) and the Red Cross Humanitarian Award – New Brunswick Region. In 2008 she received the Clarkson Laureate for public service at Massey College, University of Toronto. In May 2008, she received the Lifetime Achievement Award from the Canadian Journalism Foundation. In March 2010, she became the fourth recipient of The Calgary Peace Prize. Sally Armstrong is the recipient of seven honorary doctorate degrees and is a Member of the Order of Canada. Her book, Uprising, was selected to the 2015 Amelia Bloomer List, which selects the best books with significant feminist content that will appeal to young readers from birth to 18 years old. 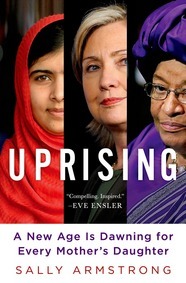 Uprising tells dramatic and empowering stories of change-makers and examines the stunning courage, tenacity and wit they are using to alter the status quo. Sally Armstrong brings us the voices of the women all over the world whose bravery and strength is changing the world as we know it. Who in the World Cares? The awesome consequences of looking the other way when the community, the corporation, the country is in trouble. Human Rights- Human WrongsYou know what’s wrong and you know how to right it, so who’s stopping you? Women and Children LastStudies done by The World Bank say the treatment of women can alter the economy. Now is the hour for action. Check out a feature on Sally Armstrong here. Follow Sally Armstrong on Twitter.